Fireplace Xtrordinair introduces the Revolution to its line of gas-burning fireplaces designed to complement a range of architectural styles. 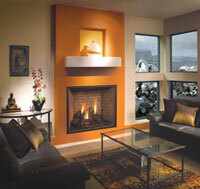 The Revolution combines a clean, traditional masonry appearance with the latest in fire technology. Available in rectangular or arched designs, the Revolution combines a classic fireplace look with no grills or louvers; its slim outside trim allows an expansive 983 sq. in. fire-viewing area. Numerous options match every décor: andiron choices, a brick fireback in two patterns; and a realistic five-piece log set. Beyond its classic look, the Revolution provides a powerful heat output to warm up to 2,000 square feet of space. Adjustable flame heat control regulation offers fine-tuning to both the flame height and heat output. Hand-held and wireless wall-mounted controls come standard, providing convenient thermostatic control over all functions including power, room temperature, and flame height adjustment.